I was invited to Le Lab, Comptoir a cocktails for my lovely cousin Josie’s 25th birthday. I enjoy a drink with a meal at a restaurant, never a bar and this place is definitely a bar. Bars usually don’t hold my interest for very long. When there’s no food and the music is too loud to talk, I start yawning. I heard this place was cool, “fun” and that the drinks were creative but mostly, I was going for Josie. Got there, the vibe was great. The music was what I like – a good variety including Michael Jackson – always a favorite of mine. The staff are dressed in sophisticated and traditional bartender attire – A white shirt, sleeves rolled up, a black vest and tie. Its like what you’d expect at a swanky hotel bar or more like an old fashioned speakeasy. On their web site they actually describe the place as a “Speakeasy moderne”. Their old school look and “French from France” accent contrasts with the darker edginess of the bar’s decor. This is another place I’ve discovered that is all about contrast and I love it. Fabien Maillard, (pictured above) a veritableBar-Chef, Mixologue, flair bartender is the visionary behind this hidden gem. Much like a restaurant chef, he creates his cocktails according to what inspires him, what is in season and uses only premium ingredients – Spices, fresh fruit juices, purees and aromatic herbs. Saying that they have a creative cocktail selection is a serious understatement. The list is endless and most interesting. They even have a cocktail made with a little BBQ sauce and a sliver of beef jerky. Talk about a burley, manly cocktail! Here are a few cocktails I picked out to give you an idea of the diversity. et bœuf Jerky doux et épicé. Crème de noix de coco, purée de mangue, piment Thaï émincé et rhum épicé Sailor Jerry. Concombre émincé, purée de framboise, sirop artisanal de sucre de canne, jus de lime pressé,vermouth blanc Dolin et gin Bombay Sapphire. donné par les champenois à Madame Clicquot. FEU DE CAMP ...the shooter I will be trying next time….You roast marshmallows over your flaming glass! I heard they “do a show” , I had also heard of flair bartending but I was not prepared for what I was about to see! It was jaw-dropping! 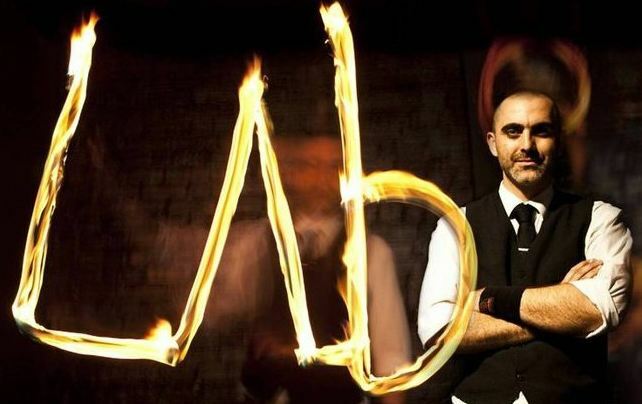 Bottle spinning….FLAMING bottle spinning, pouring a stream of fire from bottle to glass, bar on fire, FIRE BREATHING bartenders!! Sit at the bar if you dare! FYI – No cusotmers were torched during the show lol These gentlemen are professionals. The crowd on this particular Satruday night was on the younger side, mid-twenties and a few thirties, however I think that anyone can and should appreciate a superbly composed cocktail and be wow-ed by the mad skills of these artists, showmen, mixologues extraordinaire! Loved it! Hope you go!